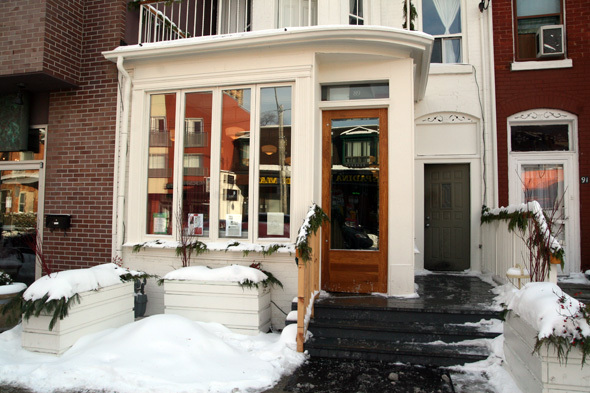 The Harbord Room, 89 Harbord Street, was recently voted the third best new restaurant in Canada by Enroute Magazine (and #2 in Toronto by this site ). Toronto critics have raved and relished and the word on the street is this is the place to see and be seen. Not a difficult feat when there is all of 18 seats in the room. It is tiny and if you get stuck in the front, it is damn cold. A curtain hangs where a double door should. A faux fireplace filled with candles stands in place of the real deal - an alternative that has always bugged me. There is a fine line between the good and the great in the restaurant business and The Harbord Room is teetering. The service is efficient yet dull. The Canadian inspired dishes are a nice homage to our culture but fail to extract any big excitement. I settle on the cod fritters ($11) to start and they are good, really good, but not excellent. They are salty and slightly over fried. Propped beside a wonderfully light celery root and fennel remoulade, the dressing is creamy and has the right touch of citrus but it sneaks under the fritters making their bottoms mushy. An Applewood smoked Cheddar grilled cheese ($11) is darling. The wild honey for dipping has the right sweetness for the sharpness of the Cheddar. The flavours are balanced. It is served with an unnecessary watercress salad. Clearly a starter, so why the side salad? I'd rather see a little bigger sandwich with less bread and more cheese. 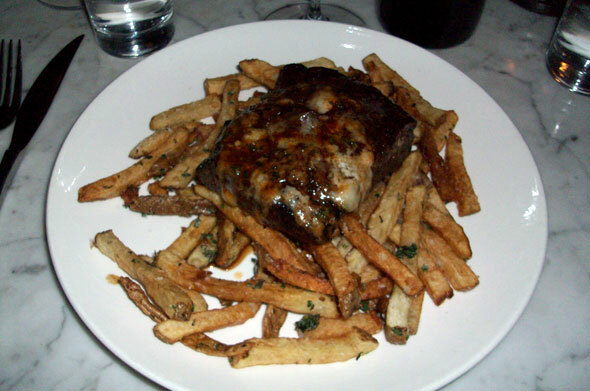 Flat iron steak frites ($21) are in one word: salty. Between this dish and the fritters (and maybe I'll admit to having some wine), I woke up the next day so dehydrated that my skin was dry. The steak was slightly overdone to medium and its taste so strong that it had liver undertones. Kind of yucky, but I didn't hate it. A flank would've been the wiser choice. Noticing a housemade catsup on their late night menu, I requested some for my frites. Nope. A big old bottle of Heinz arrives. I guess they didn't make it that day. The fresh Pappardelle with beef cheeks, squash, winter greens, toasted sour crumbs and Queso Seco ($29) tip the scale to the fantastic side. The pasta was perfectly cooked. The meat reminded me of the Sunday sauce we had growing up that would simmer on the stove for hours. That was pork but I much prefer the cheek. The crumbs were a clever addition and it is always refreshing to see something other than Parmigiano offered with pasta. The lightly smoked B.C organic salmon ($25) was a hit with two of my dinner dates. I liked the crustiness on top but could not taste the smoke. I guess they bring a whole new meaning to "lightly". With the bacon, Yukon golds, heirloom beets, apple pancake, horseradish, shallot vinaigrette, it was a bit of a circus. For dessert, a trio of pot de creme ($9). One is caramel with crunchy bits that taste like a Skor bar - it is the winner. The other has an unidentifiable taste with berries on top - boring. The third one is a blood orange creme - it had a faint taste of turkey or the smell of simmering giblets. I know that this is a truly bizarre statement but it is the truth. Almost as bizarre as the recognition this place has been given.